Faringdon is a small picturesque market town overlooking the upper valley of the River Thames, on the edge of the historic Vale of the White Horse, Oxfordshire, England. The level of membership varies around forty to fifty, augmented by up to sometimes thirty children who become temporary members for the annual pantomime. While there is a constitution and a properly elected committee to manage the society, there is no pecking order or time-serving in our approach. Everyone plays to his or her skills and there is considerable flexibility in how jobs are shared out, someone may be painting scenery in one production and directing the next. A new member is quite likely to be given a major part when they first join, in fact this is positively encouraged – assuming, of course, that they have the required skills. Having said this, no one is pressurised if someone wishes to stay behind the scenes, that’s fine. We produce at least two plays a year in May and November and a pantomime in late January/early February, with play readings and other activities in between. There is also the odd one-act play, which we enter for the Abingdon Drama Festival. We are a very friendly group of people. As well as the party after the final performance of each production, we organise the occasional theatre trip, a regular mid-summer barbecue and a Christmas dinner. New members are always very welcome, for more information or to join, please contact us. You could also come along to one of our performances or auditions and introduce yourself. 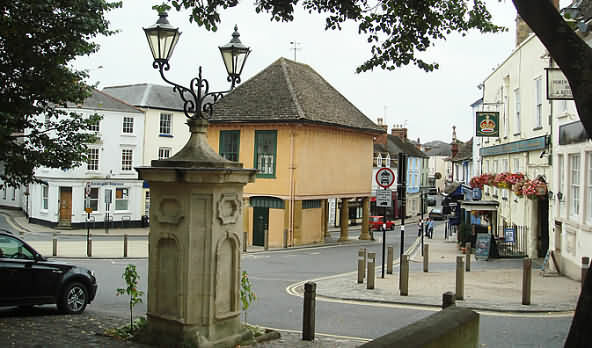 The Faringdon Dramatic Society first went online on 22 January, 2000. The whole site was originally written and designed using basic html script. A full screen image has not been kept of the original site but this was the basic design. The design changed over the years and in January 2010 with the production of ‘Aladdin’, I added a page for the booking and paying for tickets online for the first time. In 2017, I converted the website to a WordPress platform and wrote bespoke admin and page templates using php script. There was little change in the then current design but it allows for much more future flexibility. Content can now be added more easily using bespoke editing screens and automated across various pages making it is much easier to update for each new performance. The website now has over 240 pages with programs, photographs and press articles from all past productions. Penny & Jessica Lee – original creation, programming and graphic design. Ian Lee – continued maintenance, improvements and content production. The Faringdon Folly for providing most of the more recent press articles and some of the photographs. Joan Lee, Helen Barter, Peter & Jo Webster, Nigel & Brenda Keith-Walker, Dave Headey, and Gary Bates for the loan of their archive material. Adrian Wells – the website makes much use of all his excellently designed posters in many areas. Dave Headey – who has created all the highly informative programmes since 1990. Rosemary Church of the Faringdon & District Archaeological & Historical Society for allowing us to digitise all the records that she has put together dating back to 1948, which includes many photographs, thanks to Wiltshire Newspapers Ltd.